You know what’s funny about death? I mean other than absolutely nothing at all? This was a really fun autobiography! I had come across this book on BookDepository over a year ago and was immediately taken by that humorous cover. 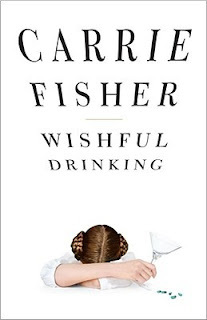 For some dumb reason I had been reluctant to buy it because I had recently discovered the wonder that was Carrie Fisher (not Princess Leia, I knew her, I’m not that lost) and was afraid that she wouldn’t be as funny in her book as she was in her interviews. Lucky for me, I was wrong. I have to start by telling you that my entire existence could be summed up in one phrase. And that is: If my life wasn’t funny it would just be true, and that is unacceptable. Hello!? You’re a grief counselor! What other conditions would we meet under? You can’t!? Well if you can’t then I’m really fucked. I have to admit it was sad to read about some of the things she wanted to do or was hoping that would happen before she died, and that we now know won’t happen. It was a bitter sweet read, but I fully recommend it!